The Rhône is not my specialty, but that does not preclude me from enjoying its wines. Indeed, some of the greatest bottles I have ever drunk have hailed not from Bordeaux or Burgundy, but the Rhône. This Cellar Favorite focuses on a bygone producer shrouded in mystique, a producer whose wines are now some of the most sought after in the world and with prices to match: Domaine Gentaz-Dervieux. I remember drinking a few bottles around 12 or 13 years ago when the late Bill Baker would sling a couple of bottles on the table for dinner with little fanfare and haughtily remark: “Chaps...now for some proper Rhône”. You could pick them up for about £30 to £40 a bottle. Nowadays, those same wines easily fetch four-figure sums, to the extent that I heard of one person that sold his stash of cases and renovated his entire house with the proceeds. I will just quickly summarize the background. Gentaz-Dervieux is basically the precursor to what is now Domaine René Rostaing. Marius Gentaz, born in 1922, farmed just 1.2-hectares of 65-year old vines in Côte Brune, eschewing the vogue for new barrels and remaining loyal to his ancient barrels, some purportedly 100 years old. He would mature the wine for up to 24 months and then bottle each by hand. Total production just 600 to 800 cases, enough to satiate its small but loyal following. His brother-in-law, Albert Dervieux, also owned a winery Verenay: Domaine Dervieux-Thaize, whose wines were said to be a little more rustic than those of Marius. He had three parcels in Côte-Rôtie: “La Garde” from Côte Blonde that was blended with a little Viognier; “La Fongent” and “La Viaillière” both in Côte Brune. The wines were aged in old wooden foudres, fined but never filtered. Albert’s final vintage was in 1989, upon which his son-in-law, René Rostaing began leasing his vineyard. René then inherited Marius’ holding in 1993 and after that, Gentaz-Dervieux and Dervieux-Thaize should have been consigned to the history books. Why? Well, they were out of vogue compared to the Côte-Rôties of Guigal, bathed in new oak for 36 months, or those meticulously and biodynamically made by Michel Chapoutier. Albert and Marius’ wines were hearty, rustic, animally expressions of Côte-Rôtie – a complete anathema to what was touted in the 1990s and 2000s. As time has gone by, there has been a posthumous reappraisal and, like Henri Jayer, since production has ceased, demand focused on what little remained. Albert and Marius’ wines might have been a bit rustic, but they aged beautifully, and came to be known as exemplars of what Côte-Rôtie should be. In a couple of years demand intensified to the point where Gentaz-Dervieux’s bottles are at the same price level as those of Domaine de la Romanée-Conti, while those of Dervieux-Thaize not far behind. What of the wine itself? Well, I tasted the 1988 Côte-Rôtie Côte Brune from Domaine Gentaz-Dervieux after a flight of rather formulaic Chapoutier wines. The Gentaz-Dervieux is on a completely different level. Showing some signs of bricking on the rim, the bouquet is pixelated in clarity, adorned with effervescent scents of red cherries, garrigue, fennel, orange blossom and wilted rose petals. The palate does not stint on fruit intensity, and yet the finesse and grace of this Côte-Rôtie is quite profound. Perfectly balanced, long and tender, the 1988 is a stunning Northern Rhône, and yet the munificent donor said he had experienced better bottles. The mind boggles. 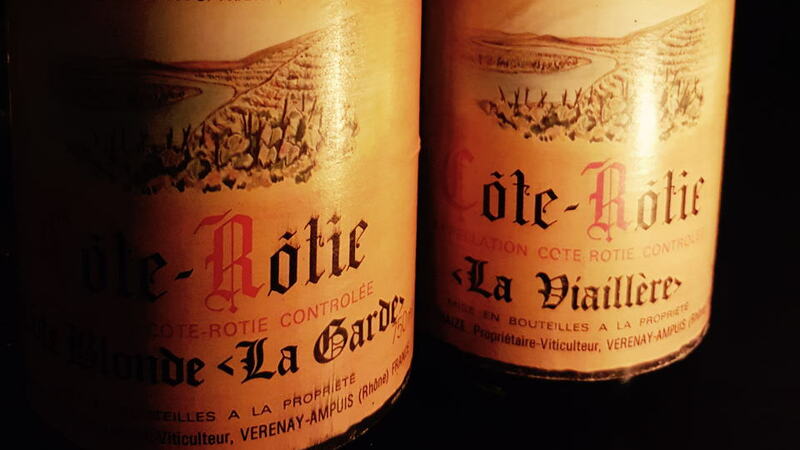 Then later at a Christmas dinner at Noble Rot with friends, including chef Simon Hopkinson and wine connoisseur Will Champion (who has a side-line playing drums in some minor band called Coldplay), Stephen Browett kindly proffered the 1985 Côte-Rôtie La Garde and 1985 Côte-Rôtie La Vallière from Domaine Dervieux-Thaize. The 1985 Côte-Rôtie Côte Blonde La Garde is utterly sublime. Pale in colour, perhaps just a little turbid, the bouquet offers gorgeous scents of garrigues, black truffles, a touch of the old farmyard, strawberries and clove, all beautifully defined, “old school” and utterly intoxicating. The palate is beautifully balanced, almost Burgundy-like in terms of tannin structure, hints of clove, fennel and sage filtering through the red fruit that lead to an elegant finish that takes your breath away. Stunning. The 1985 Côte-Rôtie Côte Brune La Viaillière was served blind next to the Côte Blonde La Garde, yet this bottle is totally different. Darker in colour, the bouquet is broody and saturnine, a little stemmy/mulch-like and rustic with melted tar and warm brick scents trying to break through that carapace of black fruit. The palate is much stockier and bucolic than the La Garde, nicely balanced but sinewy, as if this had undergone more extraction and not necessarily to its advantage. A rare and fascinating wine to taste, but I much preferred the 1985 La Garde. I have added a couple of other ancient Rhône notes so that they can be added to the database. The 1972 Côte-Rôtie Les Jumelles from Paul Jaboulet came from an impeccable cellar and given the choice of six I picked the one with the highest fill. What a wine! The bouquet is beautifully defined with leather, damp almost peaty undergrowth, black truffle and sunflower seeds. It just grows in stature in the glass. The palate is medium-bodied, very well balanced and fully mature, though it is certainly not approaching the end of its drinking plateau. It just has wonderful poise and elegance, leading to an earthy, gamey finish that leaves you satisfied. It is utterly sublime and shows more breeding than the 1972 Cornas tasted around the same time. The 1990 Châteauneuf-du-Pape Cuvée Centennaire from Lucien & Andre Brunel was served blind and frankly, I was immediately cast under its spell. This comes from century old Grenache augmented by around 15% of Syrah and Mourvédre. Demonstrating just a little bricking on the rim, it has an ineffably mesmerizing bouquet of decayed red fruit, peppermint, fennel and garrigues, all beautifully defined and vivacious. These aromas just soar from the glass. The palate is supremely well focused, perfectly balanced with a fine bead of acidity, surprisingly structured after some 27 or 28 odd years. It epitomizes everything mature Châteauneuf-du-Pape can be. The 1979 Châteauneuf-du-Pape from Clos des Papes is the oldest vintage that I have encountered to date. Served blind, I was amazed at the youthfulness and vivacity on the nose, not a million miles away from a Côte de Nuits in terms of its vibrant red cherry and crushed strawberry fruit, although the palate steers you back to the Rhône with its weight and density. There is a touch of garrigues here, menthol and sage, finely balanced and retaining wonderful structure on the finish. Whilst not always taken by wines from this estate, this is simply magnificent and still going strong after almost 30 years.